In 2011, we began to observe in our church that the overwhelming majority of school-age students were home-schooled. With concerns growing over what was being taught in our public schools, along with the knowledge of what was not being taught in our public schools, we recognized this trend would continue. While it would have been a wonderful time to begin a Christian school, our facility was not equipped to take on such a task. We then spoke with many parents who wanted to home school their children, but had no idea how to begin or what they needed to do to set a course of action into place. It then became clear what our church would be able to do. While our facilities are not large enough to house a school setting, we could begin a Pre-K ministry to help get those children on a track of learning before they were school-age. In the fall of 2012, we began this ministry as a Mother’s Day Out program. We accept children ages 2-4, and we begin teaching them the fundamental things they will need to get a head start on a home-schooled education. This program operates on Tuesdays and Thursdays. On Fridays, the mothers desiring to teach from home meet at the church and are developing the skills to teach their children. Several of the mothers are honing their skills in a particular discipline (e.g., Math, Science, History, or English). Once their children are school-age, the plan is for the mothers to swap the kids like rotating classes in a public school. This seems to be a more comfortable means of teaching for the mothers as they do not have to be strong in every class discipline. At the end of each school year, we have a promotion ceremony in the sanctuary to reward and recognize the children’s achievements. Sale Creek High School/Middle School invited Pastor Stewart to speak at their 9-11 ceremony. After mentioning God in prayer at this assembly, the high school principal and Pastor Stewart were attacked by the Freedom From Religion Foundation saying they had violated the “separation of church and state”. (which appears nowhere in our US Constitution under the First Amendment). In the aftermath of this debacle, Pastor Stewart joined Operation Jericho Project in 2013. The below saga of Pastor Alan Stewart and his battle with the Freedom From Religion Foundation is just more proof that our government run education system has for decades come under attack by powerful influences such as this organization and many others that have incorrectly used the “separation of church and state” to silence the voice of Christians in the public arena. In doing so the First Amendment of the Constitution that grants us all FREEDOM OF RELIGION has been violated time and time again. The team of Operation Jericho believes that this provides more proof that reforming the education system is not an option while it is controlled by the government – making us MORE dedicated than ever in our mission to encourage Christian families to “Exodus” the system to home school and private Christian schools. The team of Operation Jericho stands with Pastor Alan in his decision to take a stand against this organization. Gathering together to fight for freedom all in the name of religion. Local pastor Alan Stewart was invited by Sale Creek Middle/High School to speak to the students for a 9/11 memorial service. He thought everything was fine, until he says he and the Hamilton County School board received a letter from the Freedom From Religion Foundation criticizing Sale Creek for allowing a pastor to speak at a school event, and for Stewart, mentioning God one too many times. That letter sparked Saturdays rally as hundreds came together to support him and the first amendment. Heather Knox is a junior at Sale Creek Middle/High School. She was there the day Alan Stewart delivered his speech. “In my opinion there is no apology or explanation needed for the message Reverend Stewart delivered to my school,” says Knox. But the national organization, the Freedom From Religion Foundation demanded one. This after they put blame on the school for allowing Stewart, a pastor, to speak at a school function. The letter was also targeted towards Stewart who admits he used the word God and read a verse from the Bible. But he says, all he was trying to do is send a positive message through a story of devastation. “I was absolutely stunned that in my lifetime I would be told I could not pray, I could not mention God’s name anywhere in public. For me, this whole gathering is for what we’re here to do today,” says Stewart. Many stood in Veterans Park to stand by Stewart’s side. Speakers exercising their first amendment rights and the right of free speech to make their point. “I believe they have the freedom to express their opinions and that’s part of the freedoms that our forefathers fought and died for. But then so are the freedoms to worship freely,” says Hamilton County resident Daric Butler. Knox claims she took a poll asking Sale Creek students if they were offended by Stewart’s speech. She says more than 95% of the people, said no. Meanwhile, The American Civil Liberties Union of Tennessee claims prayer events are within the law as long as they are initiated and led by students, however, there are no specific guidelines regarding mentioning the word God at school events. protest. By early June, the Chinese army had succeeded in backing off the protestors. world of a lone, unnamed student simply known as “Tank Man” who stood in Tiananmen Square to block a line of tanks. In this extraordinary confrontation, “Tank Man” became an icon for the struggle for freedom. image from Chinese history and memory. How well have they succeeded in their effort? aircraft crashing into buildings and massive structures crumbling to the ground. With the most devastating attack to ever occur on American soil, the terrorists did more than register a high death toll; they struck at our nation’s psyche and removed our sense of security. triumph on that historical day? freedom.” Everyone was prepared and willing to fulfill those words. the way back home, we may just deny ourselves a wonderful future. It is our understanding that the Sale Creek Middle/High School recently held a 9/11 remembrance ceremony during the school day that all faculty, staff, and students were told to attend. We have learned that the speaker for the ceremony was a local pastor who led a prayer during the ceremony and whose speech contained numerous quotations from the Bible and other endorsements of the Christian God. While it is laudable for Sale Creek Middle/High School to organize a memorial assembly honoring the victims of 9/11, it is unconstitutional to allow religious messages and prayer to be a part of a school-sponsored event… Federal courts have struck down prayer in public schools because it constitutes a government endorsement of religion, which violates the Establishment Clause of the First Amendment. Pastor Stewart’s response to the FFRF. Download below. These are just a small sample of the hundreds of news stories every year about the attacks against our nation’s schools, churches, and civic government by these organizations claiming the constitution does not allow “we the people” the ability to practice our Christian religion in public. 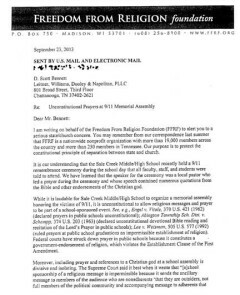 October 4, 2013 NASHVILLE – School superintendents across the state today received letters from the American Civil Liberties Union of Tennessee in response to recent reports of school-sponsored prayer in numerous public school football programs. 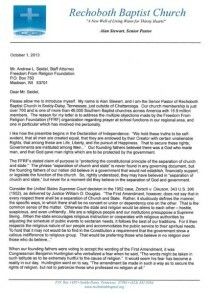 The letter provides information on the First Amendment’s requirement that public schools refrain from endorsement of religion. Cranford, NJ—American Atheists has dispatched a letter (see below) to the Hon. Todd Strange, Mayor of Montgomery, Alabama, and to Montgomery Police Chief Kevin Murphy alleging that the city’s “Operation Good Shepherd” is unconstitutional, demanding the program cease immediately. The letter arrives on Tuesday. Visit the websites of these organizations to understand their mission to destroy religious freedoms protected by the First Amendment of the Constitution. in response to this attack on her school by the Freedom From Religion Foundation. Heather was also a speaker at the Freedom FOR Religion Rally. Each year my school conducts a memorial service for the many people that lost their lives to terrorist attacks on September 11, 2001. The ceremony is open to the faculty, the students, and the community and is, therefore, not considered a mandatory event for attendance. The program involves our band playing the national anthem, the lowering of the American flag to half-staff, and a speech given by an invited guest. On September 11, 2013, Reverend Alan Stewart, our guest speaker, spoke about that horrific day. He wanted to inform the students that were not yet born during that era of how it drastically impacted our nation; for those who were alive to witness the devastation, he wanted to focus on the positive and deliver a message of hope. Reverend Stewart stated, “There was no such thing as young or old, rich or poor, black or white, Democrat or Republican. We all came together and were simply Americans.” His message was about Americans uniting as one during one of our darkest hours and was not “cheapening,” nor was it a “disturbing assembly” (Andrew Seidel, staff attorney). During his speech, Reverend Stewart did refer to a scripture from the Bible because many people in the community had asked how the terrorist attacks related to scripture. Being just a mere child when the attacks occurred, it had been difficult for me to grasp the extent of the tragedy; however, Reverend Stewart vividly painted a picture of that day, and it became all too real. In my opinion, there is neither “apology” nor “explanation” needed for the message Reverend Stewart delivered to my school. As a respected member of our community, he spoke of nothing “inappropriate.” He may be a pastor and a man of God, but there was nothing “disturbing” about allowing him to speak at our memorial service, which was not conducted with the intent of it being a religious ceremony. On the other hand, it would have been particularly “disturbing” if we had a cult leader or a terrorist speaking to us; of course, this is not what happened. If anything, we had a trustworthy role model of our community to explain to us and help us visualize what happened that day on 9/11. Were you offended by having Pastor Stewart speak at the 9/11 memorial service? Yes or No? The responses indicated that 98% of the students were not offended, and only 2 % felt differently. Furthermore, I did not ask for comments on the questions, but some people did elaborate on each question with positive viewpoints in support of Reverend Stewart. 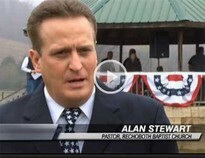 Did you feel like Pastor Stewart was forcing Christianity upon you at the 9/11 memorial service? Yes or No? The percentage was 95% no and 5% yes. Are you in any way spiritual/religious person? Yes or No? (Optional) The percentage was 7% no and 93% yes. These numbers illustrate that the majority of our student body does not need a foundation such as the Freedom from Religion Foundation to speak for us. Furthermore, the majority rules, for once again, we are citizens of the United States of America. As a student of Sale Creek Middle/High School, I could not refrain from speaking up for the student body in response to the letter sent to my school from the Freedom from Religion Foundation. The letter’s inaccuracy was not only a disgrace to the validity of the foundation’s premises for its claim against us, but it was also offensive to the freedom and values of our community. Lastly, a very important point I must make is if you don’t get anything from this letter know that my God is spelled G-o-d and it is against my constitutional right for someone to cause me to live in fear of expressing my faith in God. 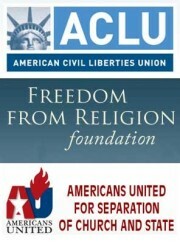 The first amendment to the constitution states that “Congress shall make no law respecting an establishment of religion, or prohibiting the free exercise thereof; or abridging the freedom of speech, or of the press; or the right of the people peaceably to assemble, and to petition the Government for a redress of grievances.” Freedom from Religion believes that what they’re doing is completely constitutional, but in reality they’re taking the words from the constitution way too far. Stewart, Alan. Response to Andrew Seidel. principal, and pastor. She wrote the following paper in response. It is called Original Intent. This is not the first time that Hamilton County has been accused of violating the First Amendment. In 2002, Hamilton County was sued by the American Civil Liberties Union (ACLU) for having the 10 Commandments hung up inside the court house in Chattanooga. They were ordered to remove the 10 commandments from the wall, and they eventually did remove the plaques. Now, the practice of opening of political body meeting with a prayer has been wide spread throughout Tennessee. Since the beginning of this nation, public meetings have been opened up with prayers. With all the lawsuits coming out over this particular “violation”, would our founding fathers have, in fact, considered this as a violation of the First Amendment? When the First Amendment is brought up, the term that is most often heard is “separation of church and state”, but that term is not found in any governing document. So where did this phrase come from? It came from Thomas Jefferson’s letter to the Danbury Baptist Association of Connecticut in 1802. The Danbury Baptist Association wrote a letter to Jefferson expressing their concern that pastors were being unfairly harassed by the government and they felt as if the Constitution was not clear on the religious aspect of the First Amendment. The people felt that the government should not make a law against where, how, or when a person should express their religious beliefs. When Jefferson responded to the letter he addressed that there is a line between the two, hence the term “wall of separation of church and state.” The question of how this applied to the states was not brought up to the Supreme Court’s attention until 1947, in the court case of Everson vs. Board of Education. However, did this principle, as it is defined today, exist in Jefferson’s letter or in the founding father’s minds? To understand the formation of the republic, you must understand why the “Great Migration” occurred. This was when people left England in search of a place where they could have the freedoms that was rightfully theirs. As Will Durant said “For men came across the sea not merely to find new soil for their plows, but to win freedom for their souls, to think and speak and worship as they would.” They did not exactly have the freedom to decide if they wanted to attend church or not. Some places made the minority faiths pay taxes to support the church. To refuse this might even result in death. They came to America to be able to practice their particular faith without being punished for not following the “official religion” of England. Eventually the thought of migrating to the new world seemed like a new and fresh start, and gave them the freedom and hope that England did not. In fact, entire colonies were created just for the simple purpose for religious sanctuaries so they could worship freely. Once in the New World, a great and powerful experience happened. From 1740 to 1770 a nationwide revival occurred. This is known as the Great Awakening. This revival was just what they needed. This gave the people of America the courage to stand up for their faith. It taught them that each individual had the power to decide what faith they wanted to practice. Two well-known evangelists of this era were Jonathan Edwards and George Whitefield. This set a fire in people’s hearts that would affect the character of our founding father’s hearts. On March 16, 1776, the Continental Congress set a day for prayers and fasting, for the finalization of the Declaration of Independence. They wanted the people to know that they were relying on God’s guidance on this huge step that was taking place in the development of the new country. The following year the Congress requested that 20,000 bibles be imported to the states due to the shortages because of the Revolutionary War. On June 28, 1787, during the Constitutional Convention, Benjamin Franklin (a man that historians consider the least spiritual of our founding fathers) stood and made a motion: “I therefore beg leave to move – that henceforth prayers imploring the assistance of Heaven, and its blessings on our deliberations, be held in this Assembly every morning before we proceed to business, and that one or more of the Clergy of this City be requested to officiate in that service” “I have lived, Sir, a long time and the longer I live, the more convincing proofs I see of this truth – that God governs in the affairs of men”. Since then prayers have opened both houses of Congress. This is a well-forgotten document in American’s history. They believed that they must have God in the schools, government, and everyday life in order to live a fulfilled life. This is what America was built on. They wanted the involvement of God in everyday life everywhere a person would go, whether it is to school or even a court house. In fact, History reveals that of the first 100 universities that were established in America, 88 of those were a Christian school, allowing religion to be incorporated with government. Also 29 of the 56 that signed the Declaration of Independence had seminary degrees. Congress stated “We are Christian people…not because the law demands it, not to gain exclusive benefits or to avoid legal disabilities, but from choice and education.” It is clear that our founding fathers intended on this country to have the freedom to practice Christianity according to their own interpretations. America does have a Christian background, but America is also the most religiously divers country in the world. Earl Warren (a liberal Supreme Court Chief Justice) stated this “I believe the entire Bill of Rights came into being because of the knowledge our fore fathers has of the bible and their belief in it. Freedom of belief, or expression, of assembly, of petition…I would like to believe that we are living today in the spirit of the Christian religion.” The fact that a liberal admitted that America is a Christian country and that the freedom to express, assemble, and petition any way is a right that is protected by the government is amazing to me. Even though a Christian foundation was established, was it intended that religion have no influence on the government? As Daniel Webster stated “Let us not forget the religious character of our origin. Our fathers brought hither their high veneration for the Christian religion. They journeyed by its light, labored by its hope. They sought to incorporate and to infuse its influence through all their institutions, civil, political, and literary.” He was an attorney, a high-ranking official in government and a dedicated Christian. President John Quincy Adams believed as did Webster. He said, of the American Revolution was this; it connected in on indissoluble bond the principles of civil government with the principles of Christianity.” There have also been several court cases that have supported that they did intend for it to be that way. In 1963, United States Supreme Court case School District of Abington Township vs. Schempp. “It is true that religion has been closely identified with our history and government.” (Emphasis added) The list goes on and on of statements from our founding fathers stating that a good government cannot be successful without the influence of religion. Pastor Alan Stewart gave a speech at Sale Creek High School’s 9/11 memorial. He quoted a bible verse and closed with a prayer referring to the Christian God. It is said that praying at school, government meetings, or any government building is against the Constitution, as well as giving a speech at one of these places quoting the bible or referring to the Christian God. If it was so unconstitutional, shouldn’t there be a place where it clearly states that these are not allowed in a governing document? The First Amendment, in fact, states these things should not be “prohibited”. Shouldn’t there be specific regulations for the separation of church and state? There is not because the principle of separation of church and state technically does not exist. The only restriction related to religion was that no official religion would be set for America. For someone to say that expressing your faith at a certain place is unconstitutional is, in fact, unconstitutional itself. It is a given right that we American have to express our faith in any given assembly. With all the evidence that is provided through documents, speeches, articles, and stories of the founding fathers, what was the original intent of the framers of the Constitution? On March 27, 1854 the Congress of the United States of America made this declaration: “At the time of the adoption of the constitution and the amendments, the universal sentiment was that Christianity should be encouraged. It must be considered as the foundation on which the whole structure rests.” The original intent of the founding fathers was that the government would not appoint an official religion, and the practice of person’s faith would be left up to the individual to decide. They started this great country to have freedoms without limitations. We are the land of the free because we are the home of the brave who are able to worship according to their own conscience.